Zimbabwean President Robert Mugabe was shown to be sleeping for much of US President Donald Trump’s speech at the United Nation’s General Assembly. 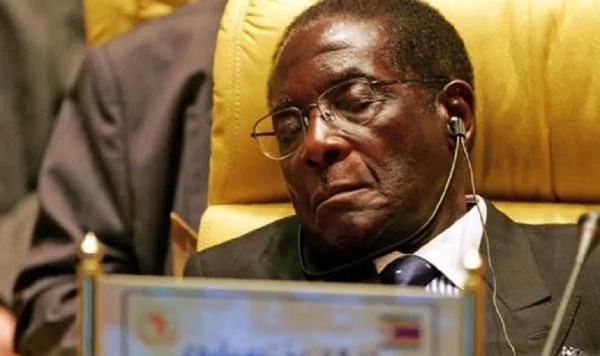 In what appears to be a regular occurrence, 93-year-old Mugabe, was once again spotted sleeping during an important gathering. He travelled to New York to attend the 72nd General Assembly of the United Nations and while US president, Donald Trump gave his speech, we gathered that Mugabe who came with a 70-man entourage slept for the most part. According to reports, the Zimbabwean government is paying a whopping $1500 per person, to cover each day of the trip which is scheduled to last 10 days. President Donald Trump’s first speech at the UN was typically fiery and inflammatory as he vowed that the US would totally destroy North-Korea if they dared launch a missile at the US or one of its allies. President Trump also fired warning shots at Venezuela saying that the US was more than willing to take further action against it. He also labelled Iran a rogue nation during his address. None of these points seemed to be of interest to Mugabe who by all accounts slept soundly through the entire speech which threatened to bring with it a nuclear apocalypse.